This evening I made a simple and quick dinner. 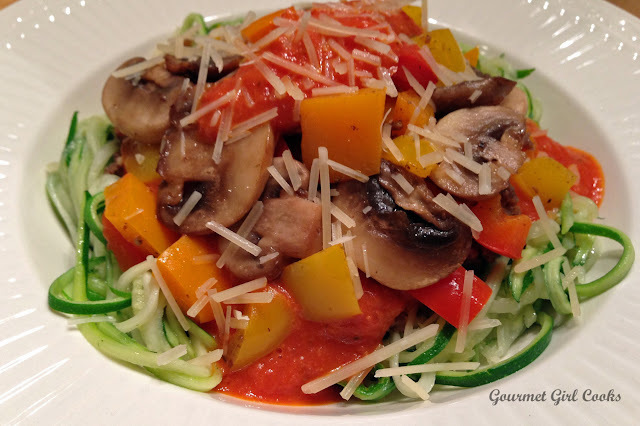 Using my julienne vegetable peeler, I made thin zucchini pasta strands that I lightly sauteed in a little olive oil. I browned a pound of ground beef very well adding sea salt, lots of freshly ground black pepper, garlic powder, cayenne pepper, sage and a pinch or two of red pepper flakes to make a quick spicy beef sausage mixture to layer on my zucchini pasta. I purposely did not put the spicy beef mixture into the sauce to keep the flavors from simmering out into the sauce. I wanted to keep all the flavors separate and enjoy them layered in my bowl. I diced and sauteed sweet red, yellow and orange bell peppers and set them aside while I quickly sauteed some fresh sliced mushrooms. This evening I decided to try Mezzetta Napa Valley Bistro "Creamy Vodka Style Marinara" (it's made with all natural ingredients and no added sugar). I heated the sauce until hot and then began layering my pasta bowl. I placed the zucchini pasta in the bottom and then topped it with the spicy beef mixture, then the diced sweet peppers and mushrooms, and topped it all with the creamy vodka marinara sauce and sprinkled with Parmigiano Reggiano. It was delicious and full of different flavors and textures -- different than if I had simmered those very same ingredients in the sauce where the flavors would have combined and melded together. This dish retained the distinct flavors of the different ingredients and turned out delicious! I snapped a quick photo below. Enjoy! For less accomplished cooks (such as myself), it would really help to have some more specific/definable information on quantities of ingredients. Thanks. Hi! For this recipe, I would use approximately 1 medium-large size zucchini per person you are feeding. I used 1 lb of ground beef and approximately 3/4 tsp sea salt, 1 tsp ground black pepper, 1/4 tsp garlic powder, 1 tsp dried sage, 2 to 3 shakes/dashes of cayenne (depending on how spicy you want your meat) and 2 pinches of red pepper flakes (depending on how spicy you like it). I diced about 1/2 each of red, yellow and orange bell pepper; 1 to 1-1/2 cups sliced fresh mushrooms and 1 jar of your favorite pasta sauce. Taste the cooked beef mixture as you go along until it is the desired spiciness you prefer. Does that help you? Thanks! This is an old standby for Gourmet Girl, and she listed the recipe for it several times. Any time you don't see specific instructions for a dish, chances are good you'll find the recipe link on the side.